My name is Akash I am studying 6th class, before I come to the CCH home, I use to play on the streets with street children. I use to smoke and talk bad words. I never go school and I never obey my elders. I don’t know what life I am living. I come to the CCH home through my church pastor. When I come to the CCH home, a few days I did not adjust with other children. I feel likeI want to run away from there. But one day my pastor told me, if you feel want to run away from here don’t run without telling us. God gave you a great opportunity to live here. So pray and ask God that your mind will be change into the Jesus. Then I just started to pray as I am praying, really my mind get a some relief, and peace, then I stopped to smoke. Now I get a fear of God inside of my heart. I am going to school. Jesus is redeemer; he was done many wonders in my life. Jesus is our savior; believe him and pray to him. If you love your parents, you can love Jesus. 4. In ten years, old will you be? What do you want your life to be like at that time? After ten years I may get 22 years old, that time I just want to see in my life wonderful for others. I want to become a doctor. Then I able to help poor children and struggling people. The pastor of this home is a public school teacher as well. He is very good at encouraging the children in their studies. The pastor’s wife is an amazing cook! Her Lemon Chicken is my favorite! They have two boys of their own and have taken in 10 orphans. These boys have great English skills and they are very artistic. Ruchit, the tallest boy on the left, won an award for best artist in their city. And Vamsi, the boy standing on the far right, is a very good dancer and choreographer. The pastor and his wife really encourage these boys to do what they love. Check out the video below! This video is 3 minutes long…you don’t have to watch the whole thing! These boys are in 5th – 7th grade. Akash and all the brothers enjoy being together and studying together. They are the oldest boys in our homes and they are such great examples to the rest of the children. 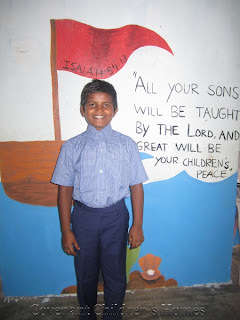 Samuel would like you to tell Akash, “God loves you!” .